The Wii U™ has been out for a little over six months. Since its initial release, Nintendo’s new system has sold nearly 3.5 million units worldwide. The Wii U’s gamepad touch screen has offered an unique way to experience new installments of beloved first party titles like Super Mario Bros. and changed the way to play a few recent AAA titles like Assassin’s Creed III and Darksiders 2. The HDMI support along with a huge internal upgrade makes the Wii U a very worthy competitor as Sony and Microsoft release their next generation systems in the coming months. As a console is released, a fresh batch of accessories are released shortly afterwards. Nyko has been a trusted third-party brand for nearly seventeen years. The company has specialized in innovating the way we play our systems. Today, we will be taking a closer look at two Wii U peripherals that not only are more affordable alternatives but also might become essential parts of your gaming collections. 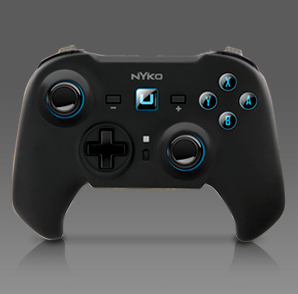 The Pro Commander controller is Nyko’s answer to Nintendo’s Pro Controller. The controller offers a traditional style of gameplay over the dual wielding of the Remote and Nunchuck, or gives your hands a break from the large gamepad. First noticeable difference between the Pro Controller and the Pro Commander is the inverted placement of the analog sticks. Unlike the Pro Controller, the Commander swaps the right analog switch to the bottom from the top while the four buttons have been moved to the top. The design simulates the design of other controllers, giving it a familiar feel. An ergonomic design makes the Pro Commander controller is far more comfortable to use over Nintendo’s Pro Controller. For someone with small hands, I favor the angles of the Nyko controller. The wrists set on the Pro Commander controller are much straighter and give a comfortable feel while playing. The buttons are quick and responsive though I found the trigger buttons to feel slightly cheap. The bottom triggers were loose but still reacted accordingly. Coated with a matte finish, the Commander is smooth and soft to the touch. It fights against finger print smudges that show very easily on Nintendo’s Pro Controller. On top of that, I have noticed that lint and dust are not as attracted to the Commander as they are to the Pro Controller. This keeps the controller clean and in presentable condition while I have to wipe down the Pro Controller each time I use it. Over all, the Commander is a great alternative to the Pro Controller. It charges via a USB cable (that is included with your purchase) and fits your hands in a natural way compared to the awkward analog placement of the Pro Controller. For $34.99, it is a fantastic accessory that I highly recommend for anyone who is in the market for a different way to play. Wii U owners have probably already realized that the gamepad has a rather weak battery. After about three to four hours of gaming, the gamepad starts to die out. Some games are playable with the Wii Remote and Nunchuck but any game that strictly requires the gamepad falls to the mercy of it’s battery life. With Uboost, you can double the life of your gamepad’s battery. The Uboost is incredibly easy to install. You gently set the gamepad face down. Then you take the Uboost and screw it into the existing holes. The screw itself is already attached to the device meaning all you must do is tighten it until the Uboost is securely set in place. Once the gamepad begins to die, the Uboost will recharge the gamepad until you have completely lost power in both devices. The Uboost is designed to rest in the charging cradle that comes with your system so you can charge the pack without the need of another cable or having to remove it from the gamepad. The external design of the Uboost is not the most attractive. Two battery packs jet out from the back, making me wish the Uboost resembled its 3DS brethren but it gets the job done. The pack itself does not add much weight to the gamepad. 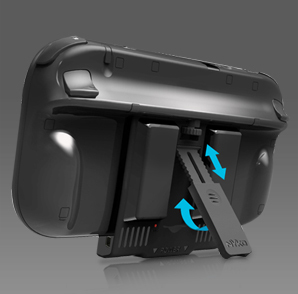 Even though the Uboost covers the back half of the gamepad, it does not block any of the necessities A sync button has been added to allow users to still sync the gamepad to the Wii U system without the need of removing the pack. A thoughtful gesture on Nyko’s part which makes the Uboost capable to use the second you take your system out of the box. Besides the extended battery life, the Uboost has a stand built into it. This will allow you to set the gamepad out on the table in case you are using it to watch Netflix or are playing a game while your television is being used. Overall, the Uboost is an essential accessory that every Wii U owner needs to own. It expands upon the time you can spend with your system without sacrificing any of the gamepad’s features. If you are a Wii U owner or are planning on being one, be sure to pick up the Uboost (either in black or white). It will be the most useful $20 you will ever spend. Disclaimer: Products have been provided by Nyko for review purposes. Images were provided by Nyko.